In between Babe Ruth and Michael Jordan there was Joe Namath, one of the few sports heroes to transcend the game he played. Novelist and former sports-columnist Mark Kriegel’s bestselling biography of the iconic quarterback details his journey from steel-town pool halls to the upper reaches of American celebrity—and beyond. 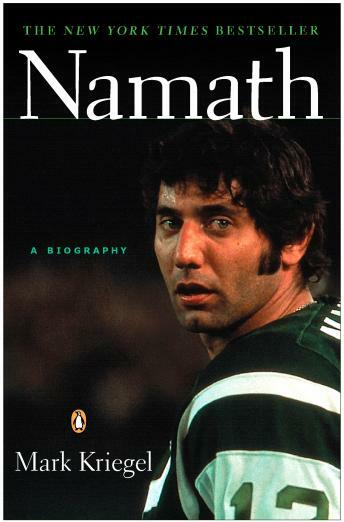 The first of his kind, Namath enabled a nation to see sports as show biz. For an entire generation he became a spectacle of booze and broads, a guy who made bachelorhood seem an almost sacred calling, but it was his audacious “guarantee” of victory in Super Bowl III that ensured his legend. This unforgettable portrait brings readers from the gridiron to the go-go nightclubs as Kriegel uncovers the truth behind Broadway Joe and why his legend has meant so much to so many.